Bright Spark Auto Repairing provides highly qualified engineers and technicians to perform and supervise all repair operations. Thanks to their experience and professionalism, we guarantee a high quality repair at your service performed with the highest quality components, genuine or Bosch spare parts when servicing your car. The performance of your vehicle is largely dependent upon the mechanical services and electrical diligence which enables you to drive safely and smoothly. We offer comprehensive mechanical and electrical services, ensuring that you always have control of your vehicle. 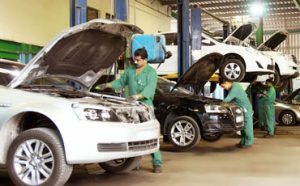 Our state-of-art service center will resolve all your car's mechanical and electrical problems at an affordable price and will improve your vehicle's performance using the latest computer diagnostic and scanning tools. Hurry up and book your appointment today!